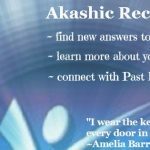 Home » Blog at Mom On A Spiritual Journey » Akashic Records » Why work with Past Lives? Past Lives – why work with them? I first came into contact with the idea of Past Lives during a workshop with a wonderful practitioner called Denise Linn. I spent a day learning how past lives have affected my present life and some of the choices I have made. It was emotional, energetic and eye opening. I’ve never regretted doing that workshop or knowing the insights that it gave me. As an Akashic Records Reader I often have people ask for readings because they are intrigued or curious about past lives…then I have those clients who have an issue which they are quite sure relates to a past lives or a past life event. They are so sure of this, they know it in their bones. So why work with Past Lives anyway? What if you could learn more about yourself in a past life in order to understand your own actions and reactions better in this life? Coming for a reading with this attitude is one of the keys to helping you benefit from working with Past Lives. We are often told on the Spiritual Journey that other people are our ‘Mirror’. For example, we can see ourselves in our children and we can learn about our best (and worst!) qualities because they mirror us, they show us ourselves in their image. And oh boy, do they! What if we could become our own Mirror for just a little while? what some of our hidden talents and abilities may be. It’s an interesting path to take. Sometimes people can ‘feel’ a past life when they have an Akashic Records Reading. We can learn a lot by looking in the mirror. Why an Akashic Records Reading honors the past and helps our future - with a little help from Hobby Lobby! Previous PostHello gallbladder cleanse and helloooo emotions!